One evening as I did my routine mail check, I saw an invite for a job interview. I was very excited. If you have stayed at home as a unemployed graduate for months, you should be able to relate to my feelings of excitement. I was surprised at first because I couldn’t remember applying to that company but then I had applied randomly to different places and so I felt this had come from one of the places I applied to. I was so anxious that I couldn’t sleep properly that night. I wondered what kind of questions I’d be asked and what the job of an HR required. I researched and got myself ready for what was to come. Before 6 a.m, I was dressed in a crisp shirt and penciled black skirt, feeling like one big madam. The fact that I could also get out early like other working class Lagosians thrilled me. I was out of the house and on my way to Ikeja before sunrise. When I got to ikeja and found my way to the address stated in the mail, the first thing I noted was that all the buildings were in a sorry state except one. This brightly painted building that held my gaze as I walked down the street had a name in front of it. Something about aerospace. In my mind, that fine building had to be the company I would work for once I passed the interview. I was already standing in front of the building when It occurred to me that the mail didn’t disclose the company’s name. I brought out my phone again and searched for the mail. It was then I discovered that the street number on the invite didn’t tally with the number on the building in front of me. It was the next building. For several seconds I stared at the three storey building in dire need of renovation and my spirit was dampened. I walked into the building anyway and began my search for my ‘new’ place of work. Since I didn’t know the name of the company, I had to approach several doors before I located the place. There were no chairs in the reception of the small office and so I had to wait outside till the time scheduled for the interview. It was while I was standing outside that my eyes caught the name of the company. Why didn’t they include that in the mail? I wondered as I typed the name of the company into the Google search bar. Nairaland quickly came to my rescue. Guess the first comment I saw as I opened the nairaland page. Don’t go for the interview!!! They are scammers! My heart cut. I kept reading more comments by victims, some of whom had come from states far away from Lagos for similar interview. After writing one useless test that they never used, they’d been asked to bring a particular sum of money to cover the cost of an equipment and training that’ll make them rich. I was so angry and disappointed. Two ladies joined me. They had also received the mail. I showed the other ladies what I had discovered. They were equally pissed. After waiting for sometime without anyone attending to us, we left, our hopes dashed. I returned to my room, annoyed that I was back to square zero. Searching for a job had been one grueling task. I was a regular visitor to so many job sites. For hours, I would be glued to the job page on nairaland. I have lost counts on the number of CVs I sent out daily. I had to come to a point where I decided to do something about my state rather than spend my day on the bed frustrated and depressed. Below are five things I did that kept me busy. 1. I signed up for a language class. At the time I was unemployed, I connected with some French speaking people who resided in the same compound with me. I developed interest and began to attend French classes on weekends while I practiced with them during the week. I knew if I moved away from that area, I might forget most of the things I had learnt since language required constant practice, but I decided to enjoy it while it lasted. It never occurred to me that my move was going to birth an adventure I’d never forget. Few months after I had begun to communicate in French, I got an opportunity to attend an exchange program in Cote I’voire organized by AIESEC. I was posted to Orphanage de Bingerville where I was assigned to a particular set of kids. I also interned with the American Corner, a sub division of the American Embassy, helping out with the English language reading classes. The family I stayed with in Cote Ivoire had very little knowledge about the English Language and I was grateful that I had learnt French prior to the exchange program. I went to the market without an interpreter, took public buses alone and visited different places. My weekly routine involved personal research work at the American Embassy library, helping out at the orphanage during the week, attending youth forums organized by AIESEC, exploring the locality and teaching English at American Corner. It was a great exposure for me. This, for me, was more profitable than sitting before a TV or staring at the ceiling. 2. I developed my writing skills. 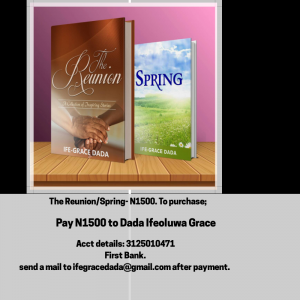 When my book, The Reunion was published, almost 98% of the feedbacks I got pointed out one story as standing out among the others. I couldn’t hear enough of how intriguing and spell binding that story was for many who had read it. Who would have known that the story would not only bless lives but that I’d also make money from publishing it. In the morning after checking my mails and feeling sorry for my inability to get a job, I would sit and write on my bed. I remembered around 2015, I asked my friends on Facebook to send their email addresses to me so I could send stories free of charge. I did that monthly for about seven to eight months. There was a time I was radical about writing stories. I practiced almost every day. I had days I wanted to just give up but I kept pushing it. I heard about the blogging and signed up for a free wordpress site where I began to share short stories and story series. Straight from honeymoon was my first series. I am amazed at how much words I have scribbled so far. Even though I didn’t have access to plenty of cash to purchase hardbacks, I had access to some e-books my friend sent to me. Because I knew I was going to spend my life writing stories, I got glued to reading lots of fictional pieces from authors in different genres. 4. I volunteered with the Volunteer Corps Nigeria. Volunteer Corps Nigeria is a non profit that organizes coaching classes and mentoring programs for public school students. Every Saturday, I participated in tutoring students in English Language. We had ice breaking session and various interactive sessions with the students. If you are interested, you can click the link below to see what they do. 5. I registered for a postgraduate program. This is the path many unemployed graduates take. Agreed, it is one way of keeping yourself sane. At least you get to attend classes, meet with other people and you can at least leave the house every week. Besides, if someone asks you, ‘what are you doing now?’ It is an easy escape from self pity. I enjoyed the classes, I enjoyed writing exams and made distinctions in many courses, but I dropped out at the end of my coursework and never quite got around to finishing my research. That’s a story for another day. I understand how difficult it is to wake up everyday wondering if something will click for you. I have been there too. I know how it feels. I have had feelings of depression at a point and got moody almost all the time. Asking my parents for cash at that time was just so annoying but there was nothing I could do. I’m grateful I do not have to do that again. You’ll find a job soon but while you wait, do something that’ll push away stagnancy and move you forward mentally. If you are yet to discover God’s plan for your life, you have an opportunity to spend more time with God now. You can acquire skills in any area of interest, take intern jobs available, read books, volunteer, find tutoring opportunities online. Just keep your mental faculty busy. You never can tell when any of those skills would be the reason you’d become a comfortable business owner or gain employment in your dream job. What was your experience like before you got into a paid job or started off your business? If you are still looking for a job, how has your waiting period been? Would you mind sharing with me in the Comment Section. No knowledge is wasted. Thanks for sharing, Dear Sis. Even though I’m still searching but I’m not where I used to be.One of the greatest lessons I learnt is not to settle for the less while job hunting.This stage of searching for job isn’t an easy one,I’ve had to answer loads of questions like ‘so you mean you aren’t workn yet?,and sometimes I get moody too but I’ve learnt to divert my energy into something productive. Thanks a lot, Ife! One salient lesson I’ve learnt from such seasons, like a period of being unemployed, is – waiting times are not wasted times but shaping times; but that depends on what you do with it. The default response at such times could be to feel moody and forgotten, compare yourself with others, complain, and tour the offline and online community searching for a “job”. Days slip into months and maybe years, and little or nothing is achieved. But if you could have a mind shift, you might just discover that God wants to use such time to prepare you for something bigger. Personally, aside getting a PG degree, trying out some little business, serving God and my family, growing spiritually, etc, God used that period to expose and prepare me to write biblical femininity truth to young women. I was never a writer, and never thought or planned to be one. I was simply interested in femininity so I could know how best to live it out. It was a good time to read and study, and I just did that, for myself. Then somehow along the line, I knew I had to share this truth with others. I started, and I’m glad and blessed doing that. But God had me “formally unemployed” to prepare me for a “divine employment”. Not like it was an easy trip, but it was well worth it, and I’m grateful for that. Chiamaka, thanks for sharing this. I love your closing charge and the scripture you shared. I’m sure this will encourage others who are searching frantically for jobs. Every stage of our lives is for a purpose. Weldone on your blog too…it’s such a beautiful place to explore biblical femininity. You are doing a lot Rebecca and that’s commendable..you may want to try a language class, tho it has its cons too. Keep writing jare and be proud to call yourself that. Wow. I also went on an exchange program through AIESEC. I went to Ghana and helped educate teens about HIV/AIDS. It was an amazing learning experience and I made wonderful friends. It was also a plus at the job interview where I was eventually employed. Googling about these job opportunities is key. May God help us not to fall prey. See my AIESEC companion o…😀😀I’m glad you went for that exchange program. It was not a waste after all… Thanks for sharing. If I say this piece was timely especially for me,it wouldn’t be an overstatement. I almost fell prey to the hands of these scammers that pose as genuine job invite. God used a friend who was familiar with the trend of things to point my attention to the address. He checked online and confirmed they were one of those scammers. God delivered me from those scammers. While waiting I have completed my master’s degree,attended a scientific conference,attended Google digital training,read important books,registered some relevant online courses. And hope to do more by God’s grace. This piece is really a blessing. …Your waiting time has been quite fruitful. Thanks for sharing them on the blog. God bless you too. Although I recently secured a teaching job, I still feel like I am waiting for a job, as in, this is not my dream job, the pay is quite good for a start, but several questions from different people recently has brought up several questions to my mind. Is this where I really want to be? How do I get to the point of realising my dreams? The first topic I taught in the school where I am now was “BUSH FALLOWING IN WEST AFRICA.” You know bush fallowing is a system of subsistence agriculture in which a farmer leaves a particular piece of land for a period of time, say 2-5 years, in order to enable the soil regain its fertility naturally, without the use of manure or fertilizers. You know, before I finished school, I was quite certain that I won’t waste time to get a job – where that certainty came from, I can’t tell, but I was just quite sure that I would be gainfully employed… but somehow things didn’t just work out as planned. April slowly faded to May, May turned to June, and July silently crept in unawares, and I was beginning to wonder what happened to me… the book “Finishing Strong” by Steve Farrar really spoke to me during that time period, especially the chapter on “Failure that Equips you to Finish Strong” as in, I just realised that God had just allowed me to enrol into UNEMPLOYMENT 101, a not too unfamiliar course to many Nigerian graduates today. I really felt like I was going through a time of SPIRITUAL BUSH FALLOWING. On the day before I took the class, that is yesterday – the 14th of August 2018, while preparing my lesson note, it just felt like God was speaking to me that He had allowed me to go through this period in order to enable me regain my natural fertility for future use, that is, this period is just like a time of sowing into my spiritual piece of land, by leaving it fallow, so that I would last for tomorrow. 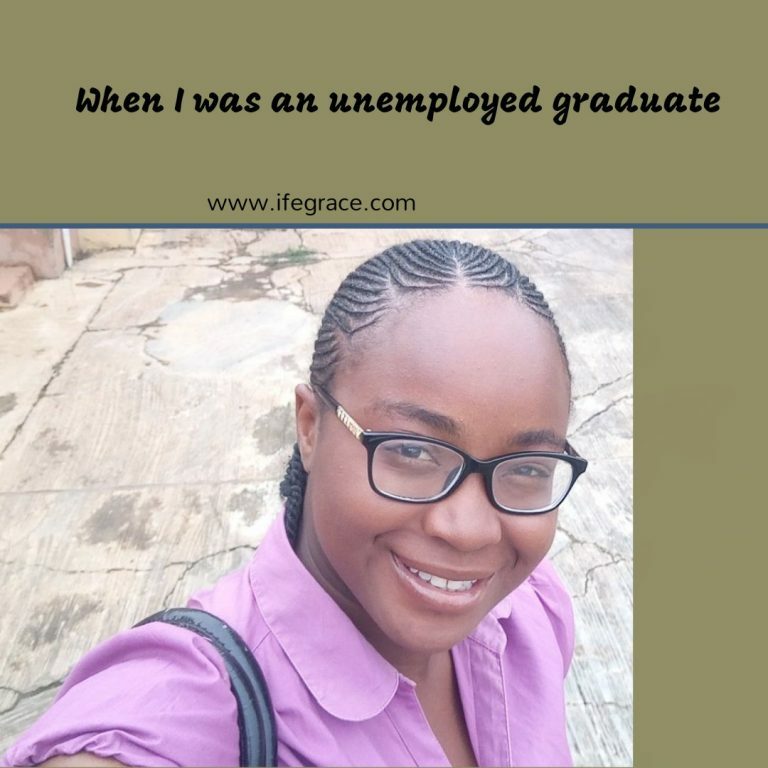 As in, it was even during this period, that I stumbled on ifegrace.com, and nearly read all I could, if not for the time factor, I also nearly read all of the stories I could on de-raconteur.com; through Ife-grace Dada, I got to know Esther Adeniyi, another blogger who is in a world of her own, and I can call her a Google SEO (Search Engine Optimisation) expert. You know what, my experience thus far has been both enthralling, and discouraging. Enthralling in the sense that I got opportunity to read others’ blogs and books like I have never done before, and I was able to get a glimpse into the light God is set to shine forth to this world of darkness, through an emerging crop of warring writers who are earnestly contending for the faith which was once delivered unto the saints, and discouraging in the sense that it seemed like an uncertain period of my life, such that I who used to think that I was very sure of where I was going, in terms of my life’s purpose began to ask questions about my real identity again, like “who am I?” “What do I want to do with my life?” “Where am I going?” Truth is, if you had asked me those questions 3 years ago, I would confidently answer you with a big grin on my face and probably lecture you a bit on how to discover your purpose in life. But now, am learning to follow God’s purpose and not my plans. To God be the glory! 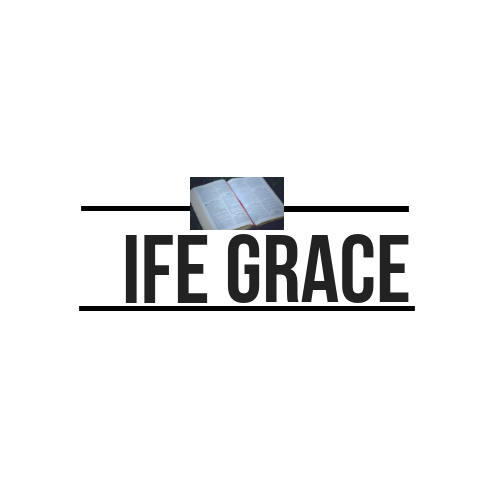 Thanks Ife-grace, for keeping the fire burning, and blazing the trail ahead of many of us. God bless you in zillion folds. My heart prays for you! First of all, I must say thank you for taking out time to churn out these words. I get your point on the spiritual bush fallowing. This time is really important to build habits that centers on our relationship with God. Thanks for the mention. I’m glad you are beginning to find purpose. Nothing matters than that. I just pray for more understanding and recognition of your assignment and grace and to fulfil it..God bless you. Amassing article!!!! but why did you drop out after your coursework? That’s not something I wanted to talk about in this article…probably in another blog post. Rounding up NYSC in 2 months time, thank u for this post, am scared of staying idle, I just applied for masters program with no sponsor, just to run away from staying at home. God pls help me in these waiting period.